Integrates jQuery UI's Datepicker tool with Lighthouse. Stores responses as year-month-day, a timestamp, and a readable string. Line 18 of the HTML can be updated with the first day of the calendar week. Line 19 can be updated to translate the names of the months. Line 20 can be updated to translate the shortened names of the days. Lines 21 and 22 can be updated with the tooltip text to be used in the calendar. Lines 17 and 32 can be updated to reflect the date format to be shown to the user or to be stored in the database, respectively. 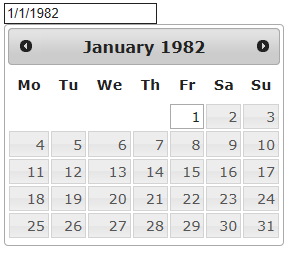 Date formatting information can be found in the jQuery UI Datepicker documentation.